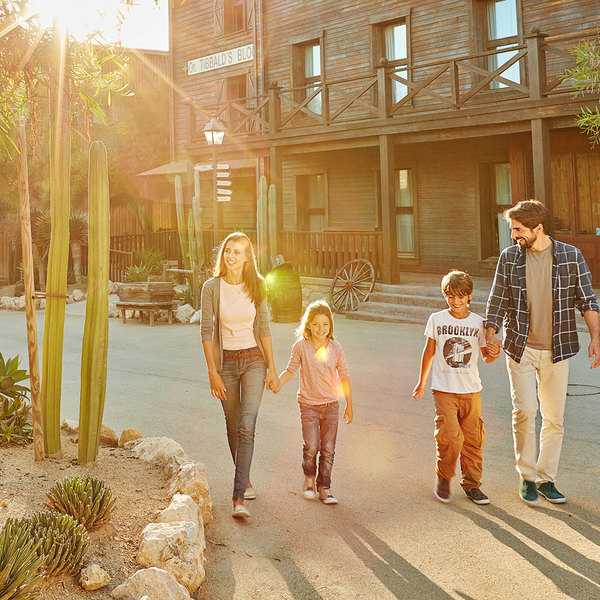 Enjoy fantastic and exclusive benefits at PortAventura's Hotel El Paso, with free and unlimited access to the theme park's facilities throughout your stay. Do you know the exclusive benefits of staying at our resort hotels? In PortAventura World hotels you can enjoy your visit to the max! Immerse yourself in the whole experience with fully themed hotels. You can also take advantage of endless benefits available to guests staying at resort hotels. Start your PortAventura World experience with complete peace of mind! Park at the hotel free of charge and check in whenever you want. You can access the room from 3 p.m. with the key that will be given to you at reception and you will receive your room number by text message. The same room key is also used for entry to the parks. You can leave your luggage in the lockers for free and access the parks from the time of opening. You can still use the lockers and access the parks even on the day of departure. A complete experience from the time of your arrival until the very last minute! Discover the enchanting Victorian town of Sullivan City and its unique services. Relax in crystal clear waters and experience all the advantages of the authentic Caribbean. Don't miss out on all the advantages that the Mediterranean has to offer.